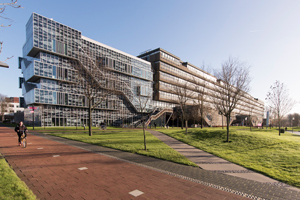 Welcome to the website of the Department of Hydraulic Engineering of the Faculty of Civil Engineering and Geosciences of Delft University of Technology. We have designed this website to inform and facilitate current students, prospective students, alumni, scientists, practitioners, media, colleagues and our staff on our field of focus. Our homepage offers access to section-related information that we control and update, to our direct "Delft" environment and it offers a login to our staff. Intertidal zones are crucial for the protection of our coast and as stop-overs for migrating birds. But, increasingly, many of these sand and mudflats are disappearing permanently underneath the waves. Cynthia Maan investigated how by cooperating with nature and using a systems-based approach these precious resources can be saved. A subject of rollicking sea shanties the world over, storms at sea have always fired people’s imaginations. But knowledge of what happens underneath the waves is not quite as universal. Femke de Jong, Caroline Katsman and Carine van der Boog are preparing to don their sou’westers to investigate the inside story. Whenever there is a problem with the Eastern Scheldt storm surge barrier, the Dutch get worried. The last time the barrier made the news was in 2013, when the stability of the barrier’s foundation protection was compromised. The tidal flats of the Wadden is where land and water meet. This natural environment has become familiar territory for researcher Bram van Prooijen and PhD Irene Colosimo, who both work at TU Delft’s department of Hydraulic Engineering. It’s where they are carrying out the Mud Motor project hoping it will provide them with the answer to a vital question: how to make nature work for us in such a way as to preserve the Wadden coast in a sustainable way. Rivers meander: it’s what they do. They make their way through the landscape twisting and turning as they flow. In the Netherlands a meandering river has become a rarity. ‘Many rivers worldwide have been ‘humanised’,’ says Victor Chavarrias who is researching rivers, with the Rhine as his case study. ‘200 years ago the Rhine meandered strongly. That made life in the floodplain dangerous and the transportation of goods very inefficient.